The Trillium Gallery features Howard Pearson's watercolor paintings of the Blue Ridge Parkway, as seen from various overlooks.Located directly across from the entrance of the Main Lodge of the Switzerland Inn, The Trillium Gallery at Switzerland Inn offers a distinctive variety of American handcrafted jewelry, pottery, blown and stained glass, wearables, wood, metal and decorative crafts by local and nationally known artists. Celebrating more than 21 years in business! Visit us on facebook to learn more. At Trillium Gallery discover unique handmade jewelry. Nancy Fleming's mix of metals, stones and fossils evolves into one-of-a-kind jewelry that makes a bold statement. Terri Logan's creations are earthy and natural using river rocks and sterling silver. Each rock has an energy or personality which is captured in the design. Fred and Janis Tate's work in precious metal is bold, yet elegant. Pieces created by Jennie Keatts feature pottery and gem stones. You will love the pearl and sterling silver designs by Rebecca McNerney with clasps so lovely you will want to wear them in the front. At Trillium Gallery discover fun and functional turned and hand built pottery. Functional pottery, turned and hand built by David and Sheri Hoffman, Sarah Rolland, Rob and Beth Mangum, and Maggie and Freeman Jones is non-toxic and durable enough for daily use, on the table or in the oven, and dishwasher safe. Fun Pottery by Laura and Mark Evangelista brightens your table and delights your guests. They use bold colors of red, black, yellow, blue, and green. Find large raku pears and apples and other pottery by Don Williams. Browse Mike Taylor's bamboo-handled vases and other fine pottery such as platters and wall hanging sculptures. You will enjoy our large selection of functional and fun pottery! At Trillium Gallery discover treasures in loose and fluid blown glasses. Glass by Prentice Hicks comes in 5 sizes and 9 colors. Colorful and fun to use, your guests will love them. Plus blown glass fruit and veggies by David VanNoppen, Thames Glass and Luke Adams. 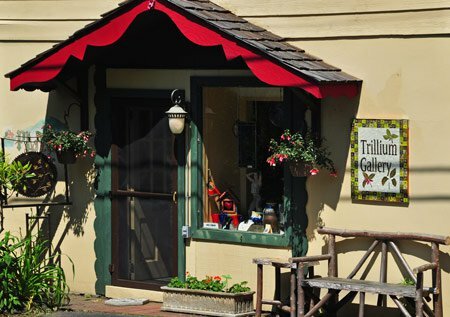 At Trillium Gallery find one-of-a-kind gifts and treasures. Discover your inner child with Christmas ornaments in the shape of clay animals dressed for all occasions by Janice Butler and blown glass ornaments by Little River Hot Glass, Theo Keller, Young Constantine and Luke Adams. y animals, birds, angels, Noah's ark and nativity sets created by Janel Lund and lifelike clay animals by Patricia Simons are other featured gifts and collectables. Plus wooden sculptures by Judy Rand, some large enough to cover a wall. Everyone loves our Little Switzerland and Diamondback merchandise, so in 2011, the Switzerland Inn opened a brand new shop in the Shops at Little Switzerland. Just off the Blue Ridge Parkway, the Switzerland Inn's new Little Switzerland Trading Company store will feature all things Diamondback. Shirts, hats, gear and even our new private label wines. We’ve expanded our line of Little Switzerland apparel and collectables that will also be featured in our new store. Check out the Little Switzerland Trading Company – our selection of Diamondback (NC226A) and Little Switzerland memorabilia expands with every season. 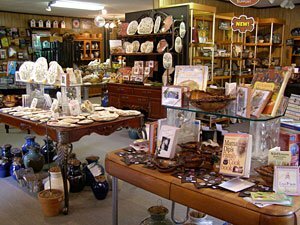 Visit Hearthside Handmades directly off the Blue Ridge Parkway in Little Switzerland, NC at Little Switzerland Village for your garden bird feeders, local pottery, dishes and baskets. We have humming bird feeders from the old standard Perky Pet to elegant glass with copper enameling. You can even find a birdhouse or feeder featuring your favorite college or professonal sports team. We are the home of These Blooming Dishes. Pottery, including dishes, plates, hanging pockets, mirrors and jewelry, made by Keith and Darlene Fletcher. In a unique process, flowers are pressed into clay. It is then fired, underglazed, glazed and then fired again. The result - a forever spring meadow to brighten any room. Handmade baskets by Patti Simmons Creations are at Hearthside Handmades. From large to small, her walnut-dyed, muted-color baskets are a perfect accent to any decor. Don't forget about our homemade jams, jellies and pickles and our handmade herbal soaps, scented candles, greeting cards, hand-carved wooden spoons, wooden boxes and chimes. Plus a wide variety of collectible Coke trays and hand-painted gemstone pendants by Bonnie Childers. Hearthside Handmades was established in 1987. The owners, Keith and Darlene Fletcher, cater to anyone who likes and is looking for local and regional handcrafted works of art. Visit Hearthside Handmades and take home a piece of the Blue Ridge Mountains. 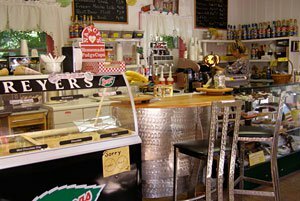 Nestled in the middle of the Little Switzerland Village along the Blue Ridge Parkway in Little Switzerland, NC is the Swiss Ice Cream Shoppe. A huge variety of classic flavors and a large selection of special flavored ice creams to choose from, plus the incredible selection of "Jelly Belly" jelly beans and freshly made, hand-dipped chocolates. The Swiss Ice Cream Shoppe is the perfect place to indulge your sweet tooth. Timberline Properties and Little Switzerland share a unique history. In the early days, Julian Davis Godwin Sr., originally of Orlando, Fla., was the first licensed real estate broker in Little Switzerland and Spruce Pine. Today Jann Godwin and her firm, Timberline Properties Inc., carry on that tradition. Timberline Properties is a full service real estate and management firm with a reputation for offering quality properties and a tradition of overall excellence. Timberline brokers are experienced Buyers and Sellers Agents who own residences or second homes in Little Switzerland and are enthusiastic in their desire to assist clients and customers in either selling their valuable property or purchasing their mountain dream home. Let us help you with all your Real Estate needs. Homes, Land, Vacation and Long-term Rentals.